Mr. Locksmith Welcomes Randall Bath to New Westminster and Delta! Mr. Locksmith Hands-On Locksmith Training in Las Vegas! 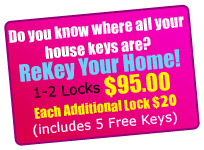 Most Popular Mr. Locksmith Emergency Call: Locked Out of Bedroom! Top Ten Locksmith Articles of 2016 and Mr. Locksmith makes the List! Customers and Friends join me again this year for Canada Day this Friday July 1st 2016 at Kitsilano Beach. I found Terry to be very punctual and he completed the job in a timely and professional manner. His prices were very reasonable and would recommend his services to my friends and family. Terry is very knowledgeable and professional and helped me get back into my house quickly! I am very satisfied and happy with the service. I will highly recommend Terry to my friends and family! I was locked out of my car at about 11 pm I had called about three other companies and no one was able to come I called Terry once and he was there within 20 mins and opened it within a few min Great customer service! © 2019Mr Locksmith Surrey. All Rights Reserved.